After draining the toilet I put everything in the toilet. I drank a bottle of cough syrup and went outside. The cat spoke to birds. The birds spoke to bees. The bees spoke to me. They swarmed in proximity to my head and said, “A culture of rampant sexual repression and misogyny promotes chaos and leads to collective violence and insanity. The veil will soon be lifted. The fourth dimension is upon us, a realm of pure consciousness constituted by a democratic and communal mind. See you there. Don’t be late.” The bees dropped to the ground and died and then came one of those epiphanic moments where everything was clear and the trajectory of my future crystallized in a single thought: store. I went to the store and picked up a forty of Olde English, a box of menthols, and a Shake Weight. “Health kick?” the clerk asked. I nodded and left without paying. Yes, I had all the instruments now for an absolute and total recovery. The cat had a sixteen-dollar a day seafood habit. I worried about money, but I worried more about the lack of it. I talked to the cat like a confidant and friend. I said: “I feel like I have two birds fighting in my heart. One bird is an eagle. The other is a dove. Our future depends on which one wins.” The cat sat in the kitchen window in the sun. It yawned and said nothing. I sat there at the empty table, listening to the screen door bang itself in the breeze. I thought I might go down to the sperm bank and apply for the security guard gig. Earlier, I’d seen a sign in their window and now I took it as one. You poured a shot and then poured your heart out. Outside, the rain poured and poured. I stood at the window watching the kid across the cul-de-sac shooting free throws in the rain. The rain fell sideways and the wind picked up and the kid hit six straight shots and you hit me in the arm and asked me what we should do and I said I’d have to think about it. I poured myself a shot, tossed it back, and thought about it. I didn’t know much about much. The kid missed a layup. I missed Mississippi. And you somehow missed the children we'd never even had. By the end of the first day I had the accent down cold. By the end of the second day I could mimic your movements. By the end of the week I’d cleaned your garage and polished your guns. By the end of the next I was wearing your clothes and smoking your drugs. By the end of the month it felt like a year. By the end of the year it felt like 1971. We were heading towards Vegas, stoned. On our way to find the American dream in action. On our way to the Criterion Collection. 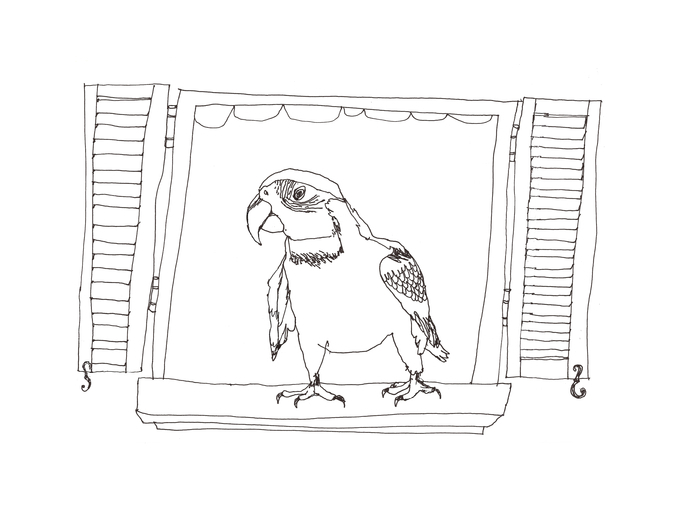 I was walking down the street and there was a parrot in a window and it said, "Hello." And I said, "Hello." And it said, "Hello." And I said, "Hello." And it said, "Hello." And I said, "Goodbye." And it said, "Goodbye." And it said, "Goodbye." And it said, "Goodbye." The medicine wasn’t working. I put up new wallpaper, talked to strangers, tried on different hats. Mel Bosworth is the author of the fiction chapbook When the Cats Razzed the Chickens, the novella Grease Stains, Kismet, and Maternal Wisdom, the novel Freight, and the poetry chapbook Every Laundromat in the World. His work has appeared in Hayden’s Ferry, Per Contra, New World Writing, and Melville House, among others. He is also an associate series editor for the Wigleaf Top 50 and the curator of The Small Press Book Review. Ryan Ridge is the author of the story collection Hunters & Gamblers, the poetry collection Ox, as well as the chapbooks Hey, it's America and 22nd Century Man. His next book, American Homes, is forthcoming from the University of Michigan Press as part of their new 21st Century Prose series. His work can be found in PANK, McSweeney's Small Chair, FLAUNT Magazine, theNewerYork, The Santa Monica Review, Salt Hill, DIAGRAM, and Sleepingfish. A former editor-in-chief of Faultline, he now serves as managing editor for Juked.